Let me tell you about this salad that chef Casey Schanen of Nell Thorn made at the cooking school the other night. Not that everything else he made wasn’t amazing, but the salad was the real eye-opener for me. 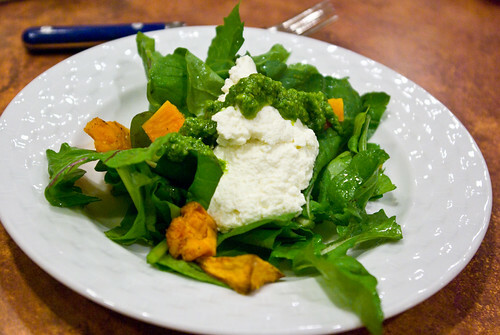 Here’s what was in it: fresh arugula, roasted squash, arugula pesto, and warm ricotta cheese. Yeah. I’ve been hearing a lot about making ricotta at home, but for whatever reason I’ve never tried it. It really is astoundingly easy, and as much as I love cold ricotta, it turns out I love fresh, warm ricotta even more. In this salad it fills the same role as fried goat cheese – the warm creaminess adds to the dressing and enriches the greens – but without the crunch (and oil). And ricotta has a fantastic springy texture in the mouth that I find addictive. So Casey heated milk, stirred in salt and fresh lemon juice, and scooped out the curds into cheesecloth. I tossed the arugula with good olive oil and salt, and we portioned it onto plates with a sprinkle of roasted orange squash. A scoop of ricotta went on top of that, then a drizzle of garlicky arugula pesto with pumpkin seeds. That was it. I would eat salad more often if it was like this. As I said, there were a few other good things to eat. 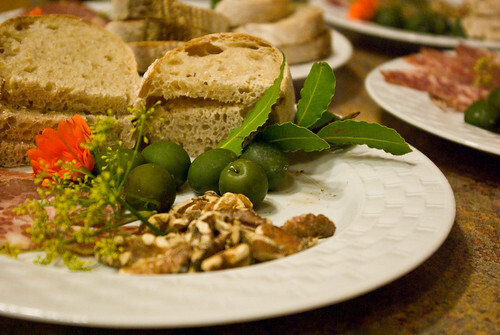 Nell Thorn bread with castelvetrano olives, house-made pastrami, and toasted walnuts, as a starter. 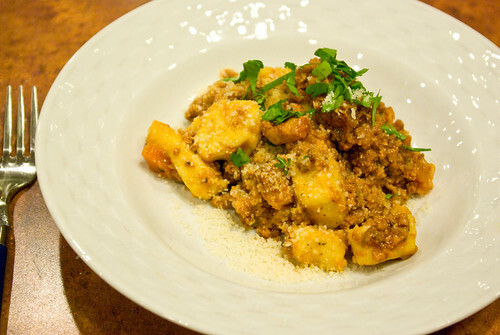 Potato gnocchi with one of the best damn pork bolognese sauces I have ever eaten. The restaurant smoked their own bacon for this. It was incredible. 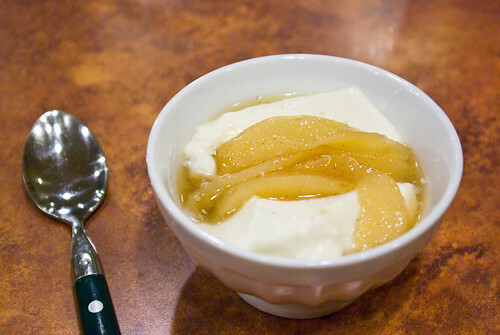 And a buttermilk panna cotta with a topping of pears poached with vanilla bean. I may not be a big dessert person, but I inhaled this. 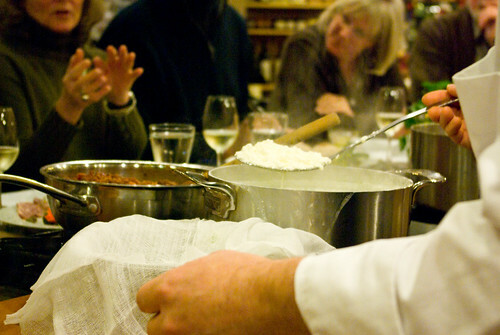 Classes like this are what keep us coming back to the cooking school. Local ingredients, real technique, great flavor combinations. And if you haven’t been to Nell Thorn yet, I really think you should go. 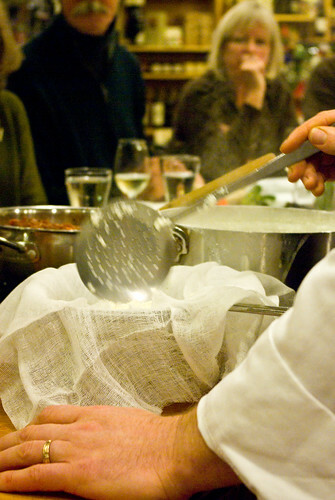 As I overheard one of the customers at the class comment, “if you can boil water, you can make ricotta.” While this may be a little bit of an overstatement, it’s pretty darn close to true. We should make sure to do this at home before too long, just so we don’t forget how easy it is.